20 Straight years of Sell outs! Thank you all for making Devil's Creek the Legend that it is! Special 22th Anniversary Edition of DEVIL'S CREEK! 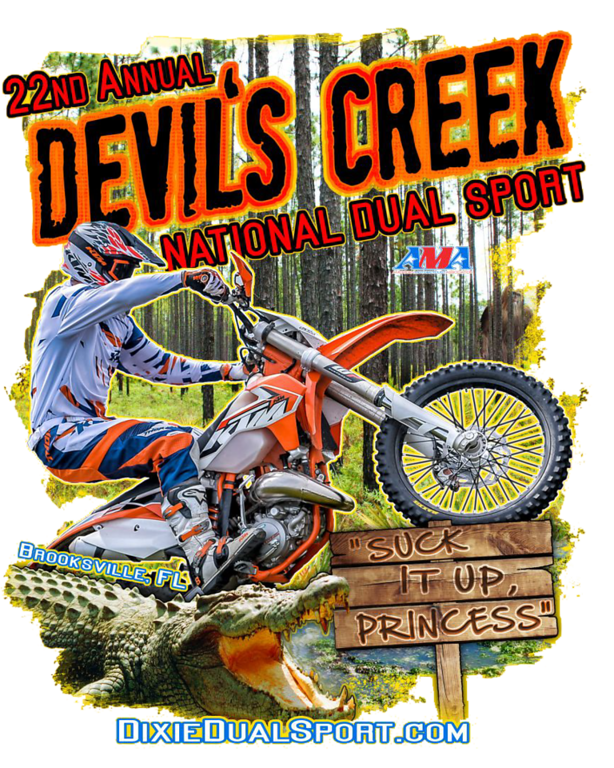 Devil's Creek is a classic style dual sport event, not a "rally". You will not find games, seminars, or speeches. You won't have time for that. This is an enduro based dual sport motorcycle ride (except Adventure route) that will take the majority of each day. You will make memories, meet new people, and discover things you never knew. You will also become part of the history, lore, and legend that is Devil's Creek. You'll leave with enough stories to share to last you all year until you come back for the next one. 130+/- miles each day! Difficulty of any route is based on rider skill, bike choice, and tire choices. Friday: Friday Adventure ride will take you places you may never knew existed. Lunch on own, dinner is back at the campground. No other routes available on Friday. If you like woods, seafood and expansive Gulf views, you will love this! Saturday Night Bullshoot: Bring your own beverages. You will need to pay for any additional persons for dinner, it is available during registration. After dinner there will be prizes and more! No additional cost but you must sign up during online registration. Bring your pre-1990 street, mx, or enduro bike! Show it off and win prizes! A bracket competition of two-man teams working up to the final championship round. Cash Prizes await the victors! Sunday is a bit shorter but still a great day riding. 3 Routes available. Lunch at the little cabin in the woods in classic Southern Sunday Country style! Specific Event Information Will Be E-Mailed To All Registered Riders. This event always fills, and fills quickly! Read some past event ride reports! Where do Creek Riders come from? We have riders come from as far away West as Arizona, Nevada and Idaho and all parts East up to Canada to ride this event! Registration $175 for both days. 2018 DDS Membership is included! No one day option available at this time as rider number is limited by the Forest Service Permit! You participate at your own risk. Motorcycles are dangerous. Do not ride if you do not have insurance. Gas Stops on route, Lunch on route. No minors please. Had some questions about tech and the sound level. Here are two great links regarding DDS Tech and sound. Please review! Any current DDS member with a street legal Dual Sport Motorcycle. If you're not a current DDS member you can join when registering! Saturday & Sunday breakfast, Saturday Night Bullshoot and entertainment, Lunch on the route both days. You'd better like to eat! Q: What about camping and lodging? Camping and lodging is on your own. With so many different variables there is no way to include this in the event. The campground start area is huge and there is never a shortage of spots, so reservations are not necessary. When you see it you'll know what we mean. Hotels are 15 minutes away. Details will be provided to all registered riders. Q: What type of Motorcycle should I ride? For the Dual Sport Option: Factory off road orientated Dual Sport and Licensed trail bikes will work best( DRZ400, 450EXC, WR250, etc...) Not suitable for KLR650 or larger. For the Adventure Option: Big bikes along with mid-sized and small. GS1200 to XT225s! It's all about back road touring! Q: What is Sound test and Tech Inspection? Sound is the Number 1 enemy of our sport and we have been doing our part for 17 years to ensure that DDS riders and events are respectful to the sport, the residents of the areas through which we ride, and other users that enjoy our forests as well! Here are two links that describe what is entailed. Please read both! Q: Fuel Range and fuel stops ? Approximately 70 miles between fuel stops. 100 mile fuel range recommended. Q: How Long Is Each Day's Ride? All mileages are approximate: DualSport 130+/-, Adventure 150 +/-, Discovery 90 +/-. Ultimately, it's as long as you make it! If you reach your limit, please, by all means, do the safe thing and head back! There are no trophies or million dollar factory contracts. This is a fun weekend, enjoy it! Q: What Category Do I Fall Into? Dual Sport Option: is designed for riders with off-road skill sets. We're not talking dirt road experience, we're talking about single track trail riding. This is for people not afraid of mud, water, sand, trees, logs, snakes, alligators and pulling their bikes sideways under trees. Like riding at Croom or Whissenhunt in GA. Discovery Option: Is designed for those who are not quite Top Gun Dual Sporters, but better than a dirt road rider. This encompasses dirt roads with a few trail sections thrown in to challenge you a little. We won't put you through the nasty stuff! Overall this is the shortest route in length. Sure. But no unlicensed motorcycles or ATVs are allowed at the campground area. Q: Where Do We Stay? Is There Camping? Hotels? Specific event and lodging information is mailed to all registered riders. It is safe to say that there are more than enough tent and RV sites (full hook ups!) at the staging area. Hotels are located about 7 miles away. So lodging is not a problem! We're old dirt riders! We still love to ride, but not with the pressures of racing! Q: How Should I Set Up My Motorcycle? What Do You Suggest? - MUST have a roll chart holder! - Should carry whatever you need for tire repair and inflation. You should know how to repair your own flats and be able to do so. We do not provide a towing service or repair center for your motorcycle. - Recommend D.O.T. knobbies on all bikes. (TKC80, D606, MT21, etc.) 50/50 and street tires not recommended. Even the Adventure route gets sandy! Since we never know how blessed we will be with rain, it's always good to be prepared for wet riding conditions! - Reroute your cab vent tubes up into your airbox. This will require a "t" connector and addition hose. - KTM riders may want to duct tape their airboxes shut to slow down water from getting in. - Add dialectric grease to your electrical connections, and give the whole engine and wiring a good shot of silicone spray for good measure! - Spare tube and irons and know how to use them. - Make sure you have fresh oil, and a fresh, fully charged battery! - Tire repair kit, whether you're tubeless or tubed, you need to be able to fix a flat, including pumping it up! While we'll route you past the nasty stuff, it's always good to get into the habit of learning what you'll need, so do what you can from both of the above lists! Especially the tire repair and rope! Panniers and top cases should be left home. They add a lot of weight and make it a more difficult ride! - Check the ego at the door. Have a talk with yourself. Know and understand YOUR skill level, YOUR riding style, YOUR expectations, and YOUR LIMITS! And when you reach YOUR LIMIT, call it a day and head back. Accidents and injuries happen when people go past their limits. - Hydration pack with plenty of fluids and some trail snacks. - Drivers license, vehicle registration, and insurance cards. - Small first aid kit: some band aids, tape, gauze pads, ointment, etc...A small bottle of acetominophen or ibuprophen in case you need it. - Dress appropriately: ATGATT! (All The Gear All The Time!) Safety first! Sturdy above ankle boots, gloves, eye protection, helmet, etc. This is a FUN weekend, we want you to have FUN, not pain! Q: What Happens At The End Of The First day? Please check-in when you finish so we know you are in. Clean up, do some bike maintenence and come enjoy the BullShoot and entertainment! Q: What About The Second Day? Second day starts a little later, but otherwise runs the same as Day 1! Q: HOW DO I NAVIGATE THE ROUTE? This is not a guided tour; you will guide yourself along a suggested route by following a roll chart with turns that are based on mileage. There will be marker ribbons along the way to aid in your navigation. Here's a link to all you really need to know about Roll Charts! GPS Tracks will also be provided in GPX and Garmin GDB format. Q: WHAT IS THE BUDDY SYSTEM? enter together will be buddies (4 or more should be split into pairs). Q: What If I Enter Alone? should pair with another rider as your buddy. Utilize the DDS Forum and Devil's Creek Facebook page to find a riding partner. Be assertive, post often! This is how many riding friends became friends! There will also be a Rider Corral where individual riders can meet in one place and pair up. It's best to begin to establish friendships on the Forum before you get to the event site! Q: What Bike Is Best? Tricky question, because riders have different skill levels on all bikes! Dual Sport Ride should be happy with KLX250s through a DR650/XRL650. Heavy street oriented bikes (KLR and bigger) are not a good choice! Adventure Ride is good for any type bike: GS1200 to an XT250. It's all about easy back roads touring! Discovery riders it's about skill level. But nothing larger than a Tiger 800 please, and that better have some D.O.T. knobbie tires on it! Q: What About Spare Parts? You should bring a reasonable amount of spare parts (like a pre-oiled air filter) and tools you may need along the trail. Motorcycle Enthusiasts KTM/Triumph will be on-site with a variety of parts for KTM and other brands. You can even pre-order items and they'll bring them out to the start site! You should be self sufficient in the tool category. Carry a small tool kit with you on the bike. Don't overdo it though. Keep it to the minimum that you may need! You must have a roll chart holder! They are available on-line, or order a great top of the line aluminum one from DDS Member Dave Hall at Billit Innovations! A personal hydration system is recommended as well! Stay safe, stay hydrated! Q: Who Services My Bike? Q: Where Will I Get Fuel and Lunch? Current DDS Membership is required as this is a club event. Membership is included for the year with registration. 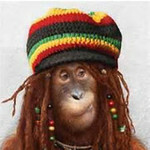 Follow the link to our on-line registration manager. IMPORTANT! Read and Follow all directions! Q: I Don't have PayPal and Don't Like On-Line Transactions? Maybe have someone else do it for you? On-line registration is necessary due to the speed in which this event fills. We will refund your entry by mail if email notice is received by February 1, 2018 at president@dixiedualsport.com After 2-1-2018 there will not be refunds, only a credit given (minus $25 late cancellation fee) to a future DDS Event. If you are concerned about needing to cancel or getting hurt and not being able to complete the ride after you have started, travel interruption insurance is available from travel or insurance agents. Mata and I In for Adventure ride and camping. In. It's going to be HUGE-AH! All signed up! See everyone at the creek! looking Forward to my first run. Hey Guys! New Member here! So I sat down last night to register for the Devil's Creek ride and found that the registration closed! (Had been traveling earlier this week and couldn't register at the time.) Any suggestions on how I can still join in? Anyone know of any cancelations? I emailed Robert, the Pres last night asking the same. Any help would be greatly appreciated. I really want to ride! Hey Guys. Update: Spoke to Robert yesterday who was very helpful. There have been a couple cancellations, so I was able to register. Looking forward to seeing everyone there! Sounds like a great time! May I give my spot to a friend? I don't think I can make it. What is the exact location of the site? Are the GPS tracks (GPX) files available for the 2018 Devil's Creek, Discovery Ride? What time should I be at staging area on Saturday for Dual Sport ride?